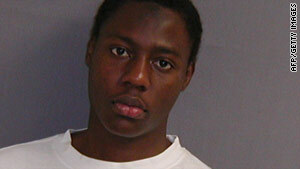 Umar Farouk AbdulMutallab "spent a number of hours" with the FBI after he was detained, the White House said Tuesday. White House press secretary: Suspect gave FBI "actionable intelligence"
Washington (CNN) -- The FBI attained "actionable intelligence" from bombing suspect Umar Farouk AbdulMutallab in the first hours after his arrest on Christmas Day, White House press secretary Robert Gibbs said Tuesday. "AbdulMutallab spent a number of hours with FBI investigators in which we gleaned useable, actionable intelligence," Gibbs told reporters. According to authorities, Nigerian-born AbdulMutallab tried to detonate explosives hidden in his underwear as a flight from Amsterdam, Netherlands, made its final approach to Detroit, Michigan, December 25. The device failed to fully detonate, instead setting off a fire at the man's seat. Gibbs declined to elaborate on the nature of the intelligence. AbdulMutallab, 23, has been tied to the Yemen-based group al Qaeda in the Arabian Peninsula. In a statement to reporters after meeting with his national security team, President Obama said U.S. officials had enough information in their possession before the failed bombing attack to have prevented the suspect from getting on the plane, but had been unable to "connect the dots." Obama said he could accept the imperfect nature of intelligence work, "but it is increasingly clear that intelligence was not fully analyzed or fully leveraged," he said, adding: "That's not acceptable, and I will not tolerate it." "Time and again we've learned that quickly piecing together information and taking swift action is critical to staying one step ahead of a nimble adversary," Obama said. "So we have to do better, and we will do better, and we have to do it quickly. American lives are on the line." In one step, senior State Department officials told CNN on Tuesday that new criteria for information collected on possible terrorists would make it easier to ban them from U.S.-bound flights. Speaking on condition of anonymity because of the sensitive nature of the material, the officials said the United States has lowered the threshold for information considered important enough to put suspicious individuals on a no-fly list or revoke their visas. If the new criteria had been in place before Christmas, AbdulMutallab would have been added to the no-fly list, the officials said. AbdulMutallab is being held at the Federal Correctional Institution in Milan, Michigan, where he's still being treated for the burn injuries he received in the failed bombing. He faces charges of attempting to destroy an aircraft, and will face his first court hearings Friday. The suspect apparently arrived in Amsterdam already carrying the explosives he planned to use, Dutch prosecutors said Tuesday. "The suspect traveled through Ghana before he arrived via Lagos [Nigeria] at Schiphol," prosecutors said, referring to the airport where AbdulMutallab boarded the flight to Detroit. "So far, it seems he already had the explosives with him before he landed at Schiphol." Also Tuesday, British officials announced that London's Heathrow Airport will introduce more body scanners within weeks, and that all British airports must have equipment to detect explosives by the end of the year. British Home Secretary Alan Johnson said the British government had no evidence AbdulMutallab had been planning an attack. Johnson added that British authorities were directing airports to carry out more random searches of passengers because metal detectors cannot spot explosives without metal parts. Last week, Obama blamed human error and security lapses for the failure by officials to act on information that AbdulMutallab was a possible terrorist threat. He had a valid multiple-entry U.S. visa. His father, a leading banker in Nigeria, had warned U.S. authorities before the attack that his son might be involved with Islamic extremists, but the information failed to prompt a response such as canceling the visa. Tuesday's White House meetings were held just hours after the United States reopened its embassy in Yemen. It's believed that AbdulMutallab may have received training in Yemen from the group al Qaeda in the Arabian Peninsula. The United States' decision to close the embassy came after intelligence suggested that four al Qaeda operatives could have been planning an attack on the compound, a senior administration official said Monday. A statement posted on the Embassy's Web site said "successful counter-terrorism operations" conducted by Yemeni security forces Monday north of the Yemeni capital, Sanaa, addressed "a specific area of concern and have contributed to the Embassy's decision to resume operations." Yemen's state-run news agency, SABA, reported Monday that two al Qaeda suspects were killed and two others were injured in clashes with a Yemeni anti-terrorism unit. CNN's Dan Lothian and Suzanne Malveaux in Washington, Per Nyberg in London, England, and Christian Purefoy in Lagos, Nigeria, contributed to this report. Cafferty: Time to start profiling?